So you are getting cheated if you buy ascorbic acid thinking it is Vitamin C. But that might be the least of the consequences you may suffer. Studies over the last several years have demonstrated that people who take high doses of ascorbic acid actually put themselves at risk for a number of health challenges. One study demonstrated that doses of 500 mg a day or more of ascorbic acid increase the incidence of arterial plaque buildup. Another study indicated that gallstones are more likely to appear in those taking ascorbic acid. Are these backlash studies against the health food industry? No, they are legitimate studies. Wait a minute, you may be thinking. What about all the studies done by Linus Pauling and a multitude of other reputable researchers who have proven the health promoting benefits of Vitamin C and ascorbic acid? Let us put a little perspective on the subject. Back in the 1930’s ascorbic acid was isolated out of little red peppers. The man who first performed this experiment was Dr. Albert Szent-Gyorgyi who won a Nobel Prize for his work. What he also found, which has mostly been ignored until recently, was that ascorbic acid was far more biologically available and active while it was still in the red pepper. Ascorbic acid can be created in the laboratory much less expensively (and of course much more profitably). Scientists discovered that they could take corn syrup, mix it with hydrochloric acid, and voila: ascorbic acid! (By the way, the corn is more likely than ever to be genetically modified and of course not organically grown.) Then they discovered the importance of bioflavonoids, and figured out how to produce these synthetically to be added to the ascorbic acid. Today there is a broad variety of ascorbic acid products with various things attached to them. With all this research, time, thought and dollars being put into creating a synthetic vitamin C, the fact remains that none of them can come even close to the potentials of what Mother Nature makes. One important factor that science has not been able to duplicate is the special kind of energy that holds living food together. Whether this energy is found in the enzymes or in the energy patterns of whole food structures, it is unlikely that science will ever be able to reproduce it in a laboratory. This may be one of several reasons why studies have shown that the body will absorb close to 100% of the vitamin C that is consumed as part of a whole food, whereas barely 10% of the “stripped down” ascorbic acid is absorbed. Again it is an issue of what we are willing to put into our bodies. Just as you would not shop for a car by buying the various pieces at different places, but look for a whole vehicle that has been synergistically put together by its creator/manufacturer, so Mother Nature has created foods for us that are complex and exactly designed to work in a synergistic way with the design of our bodies. One of the best sources of natural Vitamin C is Camu Camu. 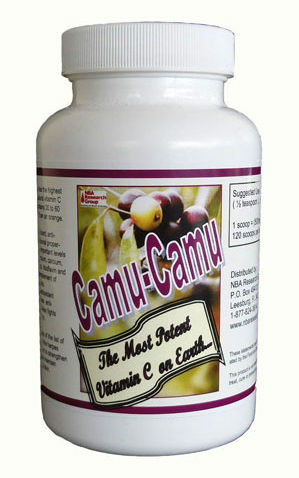 Camu-Camu has more natural Vitamin C than any known botanical on the planet. and connective tissue to name just a few.